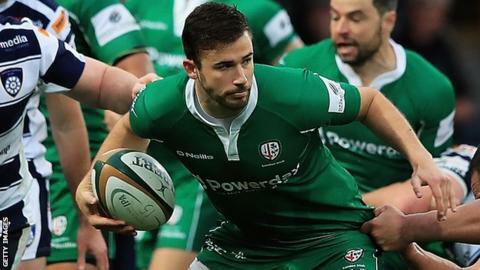 London Irish came from behind to beat Yorkshire Carnegie in the first leg of the Championship play-off final. The visitors took an early lead, Tommy Bell kicking two penalties before Danny Hobbs-Awoyemi went over for a try. But scores for Mike Mayhew and Jonah Holmes, along with a Joe Ford penalty, put Carnegie ahead at half-time. Fergus Mulchrone crossed to restore Irish's lead, while Bell kicked three penalties to give his side an 11-point advantage going into the second leg. Ford also kicked his second penalty of the night after the break, but they were the only points of a disappointing second-half showing for Yorkshire, while Irish improved their chances of making an immediate return to the Premiership following their relegation last season. Carnegie could also be without forward Sione Faletau for the second leg at the Madejski Stadium on 24 May, after the Tongan was taken off with a head injury. London Irish are unbeaten in the league at home this season, winning 41-17 when they hosted Carnegie in December. Yorkshire Carnegie: Elder; Holmes, Lucock, Casson, Stegmann; Ford, Davies; Beech, Mayhew, Faletau, Smith, West, Stedman, Mayhew, Burrows (capt.). Replacements: Graham, Boyce, O'Donnell, Myerscough, Beck, Green, McColl. London Irish: Bell; Lewington, Tikoirotuma, Mulchrone, Ojo; Marshall, McKibbin; Hobbs-Awoyemi, Paice (capt. ), Franks, De Chaves, Sinclair, Coman, Cowan, Treviranus. Replacements: Porecki, Court, Hoskins, Robson, Narraway, Steele, Tonks.